The annual campaign to end the R Word in Rochester is underway. "The R word, retarded, is an ugly and demeaning word, and has no place at City Hall or elsewhere for that matter," said Rochester Mayor Lovely Warren, shortly before reading a proclamation that Wednesday, March 1st is the day to spread the word to end the word in the city of Rochester. "It not only hurts those with intellectual and developmental disabilities, it hurts families and friends, as well," she said. The campaign to end the R word started in 2009, and some local 60 organizations are now participating, including many schools and colleges. Ann Costello is Director of the Golisano Foundation, which has led the local campaign since 2011. She says the use of the R word is as cruel and offensive as any other slur. "The goal of the campaign is to raise awareness and to educate the general public on the demeaning and hurtful definition and the use of the word retarded. Often used as a slur, and without knowing it, it is a form of bullying," she said. One other goal of the campaign is to replace the derogatory R word with another R word -- respect. To that end, the Arc of Monroe is partnering with the Rochester City School District, the City of Rochester, OPWDB ACCES-VR, and the Strong Center for Developmental Disabilities on the "Project Search" program. It offers internships for those with developmental disabilities, according to Kayt Davidson, assistant director with Job Path at the Arc of Monroe. "Our interns are getting jobs at any business you can imagine in the community at the end of the program, so they're learning really valuable skills throughout the year, and we're making very good employees," she said. The University of Rochester Medical Center also supported the “Spread the Word to End the Word” initiative and collected dozens of signatures on a pledge of its own. Strong Memorial Hospital’s cafeteria showcased a display filled with artwork created by persons with intellectual disabilities. Danny Corning is the co-director of the American Association of Developmental Medicine and Dentistry, an advocacy group for people with disabilities. Corning said they organized the event as a starting point toward creating more accepting attitudes. “It started out as a medical term to mean ‘slow’, but then it was taken into popular culture and used in a derogatory manner so now we’re trying to help,” he said. 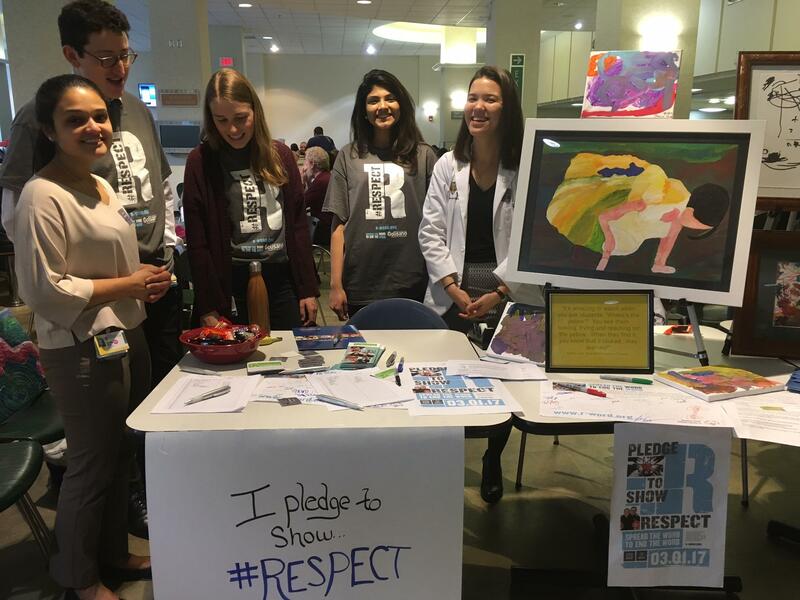 Medical students pose behind a pledge station at Strong Memorial Hospital. People can sign the pledge to end the R word at City Hall, or online at r-word.org.